Rooted in Berber culinary tradition, the tagine (or tajine) is a two-piece portable clay oven that consists of a circular, shallow base dish and a cone- or dome-shaped cover that fits into the base. The tagine pot produces its namesake dish: a slow-cooked stew of vegetables (potato, carrots, peas), meat (usually lamb, chicken or fish) and a variety of regional herbs and spices like cinnamon, ginger, cumin and paprika. Nuts and fruits like prunes, apples, quince, preserved lemon and olives are also common ingredients in a traditional tagine dish. 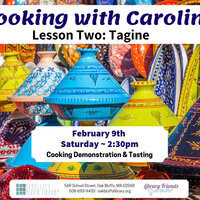 Learn how to use this shapely North African cooking pot, see it in action, and taste test the delicious results.